It's that time of year when North German beer gets a flavoursome and chewy boost – yes, as the nights draw in and the mercury plummets, we get ready for warming Winterbocks and Weihnachtsbiers. Of course there are other tasty Bocks produced year-round, but these malty, brown, and often roasty, nutty and/or spicy brews are much more seasonal in character – think of them as a dark step on from the lighter Märzens of autumn. First to reach the shops this year – around here, at least – were two breweries from right up north , towards the Danish border: Dithmarscher and Flensburger. Both of them produce excellent Dunkels so I was looking forward to their Winterbocks. Both of them class as Doppelbocks, weighing in at 6.8% and 7% respectively. Dithmarscher's Urbock (=original bock) is chestnut brown with a little malt and a faint tang of orange on the nose. A little sweet at first, you then find hints of orange and apricot and it finishes with typically German herby-peppery hops and some burnt caramel. The burnt caramel is a bit of a theme with these beers. It's there in the 2012 edition of Flensburger Winterbock too, along with fruity malt aromas that feed through into a nutty body with a good alcohol bite, burnt caramel, and some peppery hops on the finish. I also briefly met a third example of the style at the Hamburger Craft Beer Day - Ricklinger Weihnachtsbock. Rather darker, this dark 7%-er brought hints of treacle and roast malt, with peppery notes. The next ones I spotted on the shelves were not one but two examples from Einbecker – a 5.3% Weihnachtsbier and a 7.5% Winter-Bock. The well-crafted amber Weihnachtsbier appears to be new this year but is typical of that style, being fairly dry and toasty, with burnt-bitter notes and some grassy hops layered over something resembling a Vienna amber lager. This year's Winter-Bock is vinous and slightly syrupy sweet, but the sweetness is well balanced with notes of burnt raisins and barley, some dryish hops and a good alcohol bite. Turning from the oldest to the youngest, Hamburg's Astra brand – now owned by Carlsberg and used as the trendy face of Holsten – has a 5.9% winter beer just out called Arschkalt. This literally translates to Arse-cold, which I guess is a bit like British breweries calling their winter ales Brass Monkey or somesuch. The label is designed to look like it's been torn off and a new logo scratched in. Fortunately, the contents mostly live up to this arty conceit – the dark amber beer has a nice balance of hops and caramelly burnt biscuit, with toasted fruit just about detectable in the background. There's no great complexity there, but it's pretty quaffable. Just don't do what the marketing idiots suggest and drink it chilled, because then it merely tastes thin and burnt. As you may guess from the above, there is a fair degree of similarity in all these beers, as if the brewers have been given a style guide and told to stick with it. I guess that means at least you know roughly what to expect when buying – and fortunately there is still a little room for individualism. The best of the bunch? For me it's the Einbecker Winter-Bock, though the Flensburger runs it close. Incidentally, Einbeck (which is not far from Hannover) is regarded as the origin of Bock. 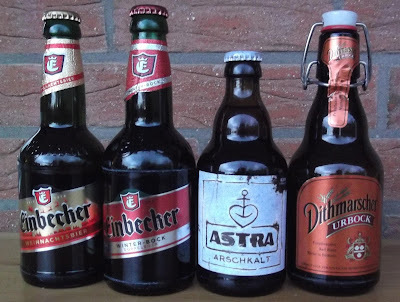 According to legend, its strong dark ale became especially popular in medieval times at the royal court down south in Munich, where the local accent turned its name into first Ein Bock (=a billy goat) and then just Bock. The Bavarian brewers then copied the style and shifted it over to bottom fermentation; even the northern examples are now bottom fermented lagers rather than top fermented ales. What does Winter Beer mean to you?